The recent release of the Renewable Energy Country Attractiveness Index (RECAI) by global consultancy EY has seen the UK drop one from 4th to 5th. 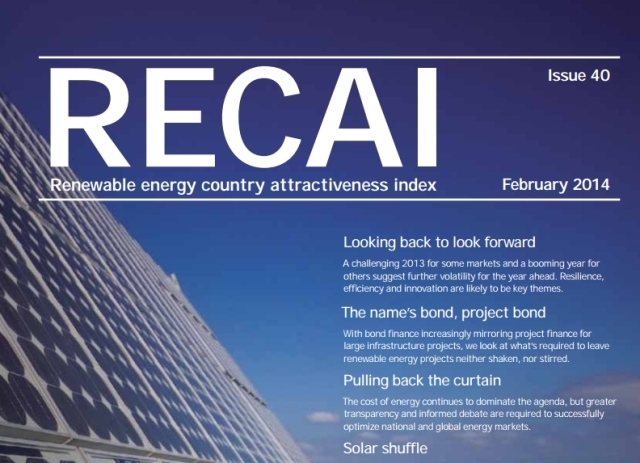 The RECAI report ranks its 40 entries on the attractiveness of their renewable energy investment and deployment opportunities. The latest rankings show gains for countries including Japan, Canada and Brasil. Losers include Australia and the UK, both markets where political decision making is putting investment at risk. The list is headed by the USA, China and Germany. According to EY, new investment in clean energy fell by 11% in 2013. Partly this reflects falling technology costs in a maturing sector (a decrease in the cost per MW). EY also clearly highlights, however, that policy uncertainty is reducing investor appetite across many markets. There are some positives from a UK perspective. The authors highlight over 18GW of applications for the “final investment decision” programme and an £800m boost for the Green Investment Bank. On the downside, they list political point scoring over rising energy bills, failure to agree a 2030 decarbonisation target and lack of details on the Electricity Market Reform. Despite the second annual dip in investment, the EY report outlines a positive outlook for 2014 and beyond and points to new markets, new technologies and new sources of capital as positive signals. Looking ahead, the authors are keen to see policies that build resilience into the market. One call they make that seems particularly relevant in a UK context is the need to depoliticise the energy debate. If you would like to find out more, you can download issue 40 of the Renewable Energy Country Attractiveness Index from the EY website here. This entry was posted in Clean Energy, Green Business. Bookmark the permalink.